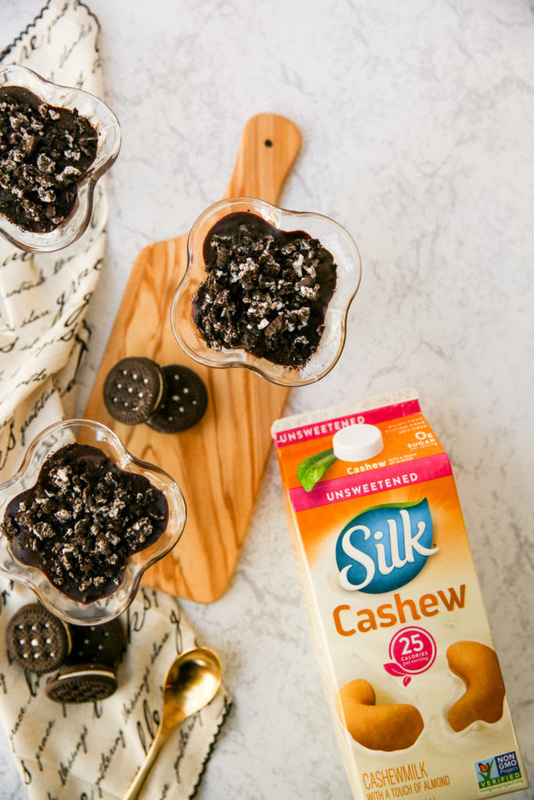 I developed this recipe for cookies and cream chocolate pudding in partnership with Silk (sponsor). I use Silk products in my daily life and am excited to share this product – and recipe – with you. One of the goals of Good For You Gluten Free is to show you just how many foods you can eat while following a strict gluten-free diet… and of course, I never skimp on showing you all the wonderful gluten-free desserts you can enjoy too. There are so many naturally gluten-free desserts that require no flour or funky swaps of any sorts; rather, they just require a little effort and know-how. That’s why I’m excited to share my new recipe with you today. It’s for cookies and cream chocolate pudding. Chocolate pudding is incredibly easy to make at home and requires only a few simple ingredients. Once I learned how to make pudding at home, I stopped buying those overly processed pudding boxed mixes and now solely make my own mix at home with a few simple, clean ingredients. On top of that, I have learned to make this recipe not only gluten-free, but also dairy-free. 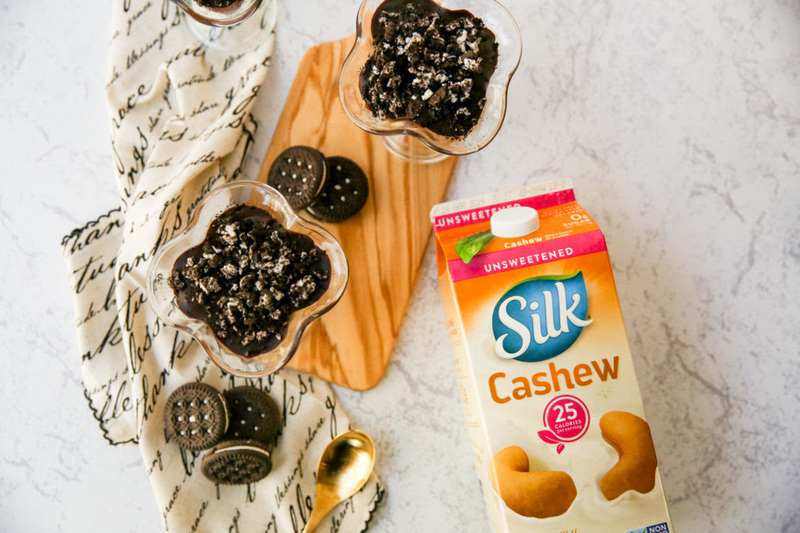 The secret ingredient to making this dessert dairy-free (and still rich and creamy) is Silk Cashewmilk, which I found on sale at Sprouts Farmers Market during its “Plant-Based Tastes Great Sale.” This stuff is the best! What’s In My Homemade Chocolate Pudding? I think so many of us are stuck on the fact that pudding either comes pre-made in little plastic cups, or it comes from a box mix. Most of us just don’t realize how few ingredients are needed to make a fresh, cleaner version of chocolate pudding at home. 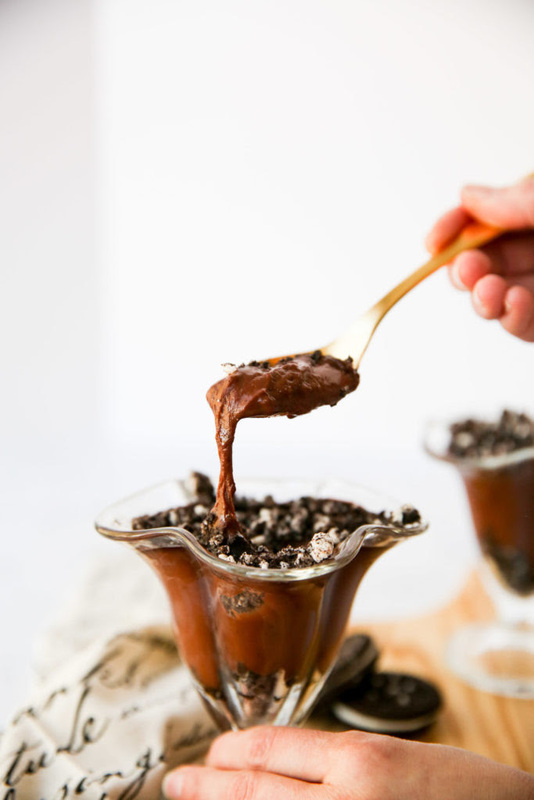 This chocolate pudding recipe, for example, includes a few simple ingredients that I bet you already have in your pantry. There is no need to source a million different ingredients from a million different stores. Silk Cashewmilk – I personally love the taste and texture of Silk Cashewmilk and Silk Almondmilk. Both work well in this recipe. I have not tested this recipe with Silk Soymilk or Silk Coconutmilk, but I have a feeling it will work, too. Cocoa Powder – Cocoa powder makes your dessert rich and chocolatey – it’s a must! I like to use organic, fair trade cocoa powder whenever possible. Raw Honey – I recommend swapping refined white sugar for raw honey, a less processed, natural sweetener. I notice a slight texture change when I use honey (the final product is thicker), but it still tastes like the rich and creamy chocolate pudding I know and love. Cornstarch or Tapioca Starch – I used tapioca starch, which gives it a slightly more gummy feel, but if you’re okay with cornstarch, it works best. You need this starch to thicken the mixture into the pudding texture you know and love. Vanilla – Vanilla extract adds an extra layer of flavor and sweetness. I highly recommend using a dash of it. Cookies – What cookies and cream chocolate pudding would be complete without the cookies?!? I picked up gluten-free sandwich cookies at my local Sprouts Farmer’s Market. Sprouts has a large variety of gluten-free cookies, so pick one that looks good to you and go with it. These particular sandwich cookies do not contain dairy; of course, you can use any gluten-free cookie of choice to make this recipe your own. To make chocolate pudding from scratch, simply combine the Silk Cashewmilk with the cocoa, honey, vanilla and salt and then heat it, stirring often with a wire whisk. Once the mixture is gently bubbling, you’ll add the cornstarch slurry (1/2 cup of Silk Cashewmilk combined with starch) while whisking away until incorporated and slightly thickened. 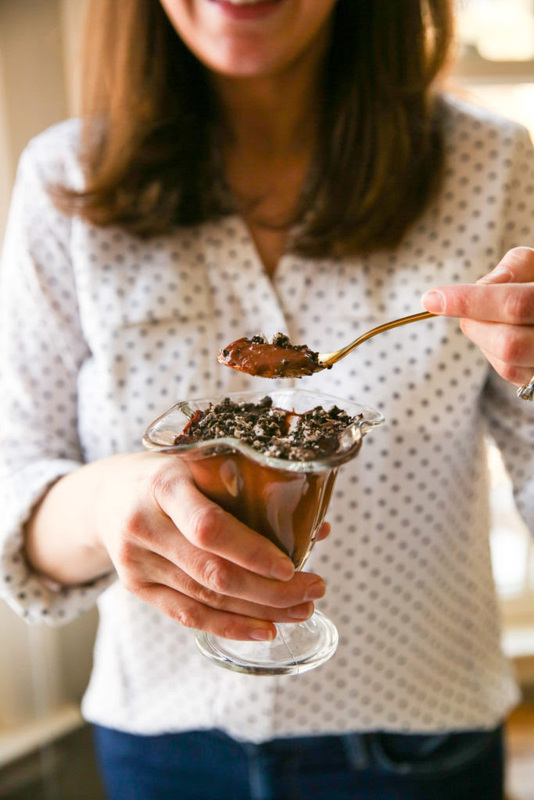 And then comes the fun part… layering your chocolate pudding and crushed cookies in your dessert cup. I used gluten-free chocolate sandwich cookies because I love how they look as “layers” in my pudding cups. Isn’t it pretty?!? I put a handful of crushed cookies on the bottom of the cup and then sprinkled a handful of the cookies on top. Having two layers allows you to enjoy cookies in almost every bite! Plus, the crushed cookies at the bottom are easier to get out than the pudding, which can stick to the bottom of the cup. Free of dairy, lactose, casein, carrageenan, egg, peanut and MSG. Free from gluten – the only Silk product that may contain gluten is the Silk Oatmilk as it does not come from certified gluten-free oats. Verified by the Non-GMO Project’s product verification program. You can get Silk Cashewmilk at Sprouts Farmers Markets. If you visit Sprouts between March 27-April 23, 2019 during the Plant Based Tastes Great sale, Silk and Soy Delicious products are 35 percent off – score! OK, enough talking about this delicious and naturally gluten-free dessert… time to get cooking! Here’s the official, printable recipe. Enjoy! 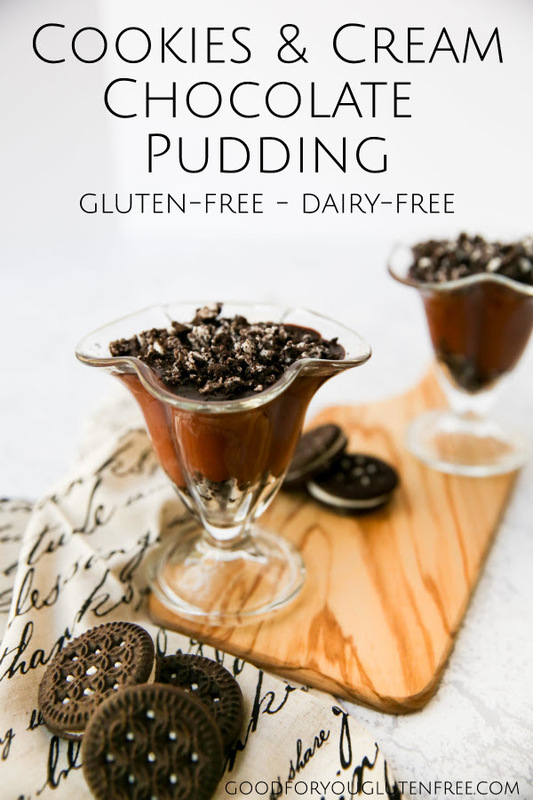 This chocolate pudding is not only decadent and creamy, but it's also free from dairy and gluten so you can enjoy it even if you have a gluten or dairy sensitivity. Add crumbled cookies of your liking to elevate your chocolate pudding to new heights. 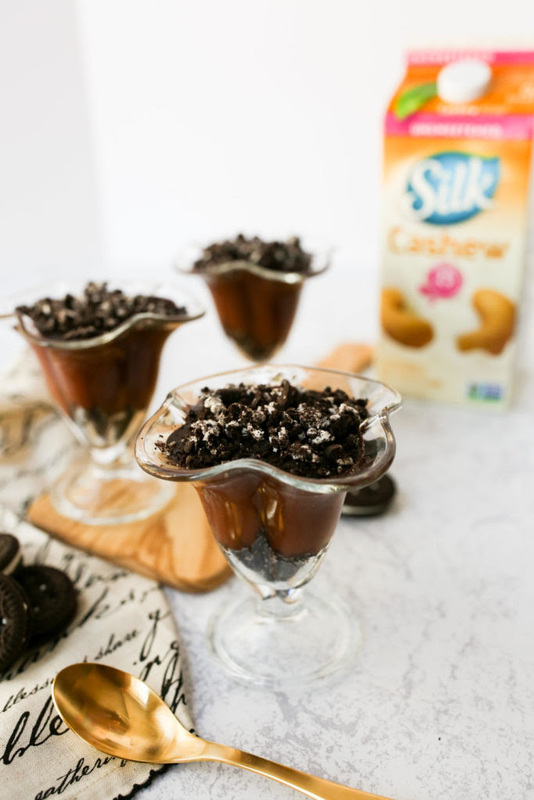 I used gluten-free sandwich cookies to make this cookies and cream chocolate pudding irresistible! Combine 1/2 cup of Silk Cashewmilk with cornstarch or tapioca starch. Mix well and set aside. This is your "cornstarch slurry." Combine 2 cups of Silk Cashewmilk, cocoa powder, honey, vanilla and salt in a pot and whisk over medium-high heat. Once mixture begins to gently boil, add cornstarch slurry mixture while whisking until well combine. The mixture should thicken (and it will continue to thicken upon refrigeration). If the the mixture seems too soupy, add another tablespoon of cornstarch combined with 2 tablespoons of Cashewmilk or water and whisk into gently bubbling mixture. Allow mixture to simmer (with occasional whisking) for one minute, then remove from heat. To layer your cookies and cream pudding, add about 1/2 of crushed cookie mixture to the bottom of each bowl (this recipes makes 4 bowls), then add pudding mixture in the middle, and then top the pudding mixture with crushed cookies. Refrigerate for two hours or overnight before enjoying. You can use any crushed gluten-free cookie of choice. I used Glutino sandwich cookies, but any old cookie will work!